Charles was living in Texas. Sadly, he lost his first wife to illness and his brother-in-law/friend to illness. Looking for a new start, he decided to move to Indianapolis. While in Texas, Charles had met and was friends with Kendra. They corresponded by email and by phone. Charles slowly overcame his grief and was ready to take a chance with someone new. When it became clear their relationship was growing, Kendra decided to move to Indianapolis too. Happily, Charles and Kendra made their commitment official by getting married. Part of being a couple is persevering together. 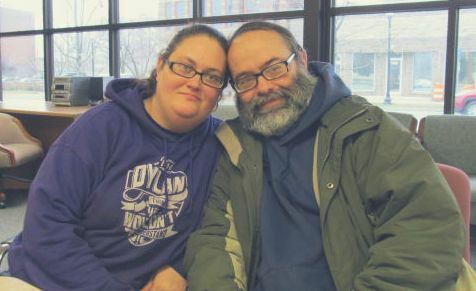 Charles and Kendra did not imagine that would mean navigating their existence as being homeless. However, the couple made the best of the situation. They lived at an encampment with others experiencing homelessness. They visited Horizon House to do their laundry, take showers, receive their mail and to utilize Eskenazi Health Pedigo Health Center for medical and mental health needs. Fortunately, they had each other for support and a reason to hope. Despite the complications of being homeless, Charles obtained a part-time position. He hopes to move to full-time employment with the opportunity to get benefits for himself and his wife. Kendra entered into a program to become a social worker so she can work with children. As they worked on the parts of their lives they could, they also met with a Case Manager who helped them find an opportunity to be housed. This was very welcomed news! Accordingly, they started the process of looking at apartments to find a real home. Although, their journey had not been easy it was finally all coming together. Now, Kendra and Charles look forward to their future and to making a home. No matter what else may happen in their lives, they know they have each other. Please click on the Donate button to make a gift to Horizon House. 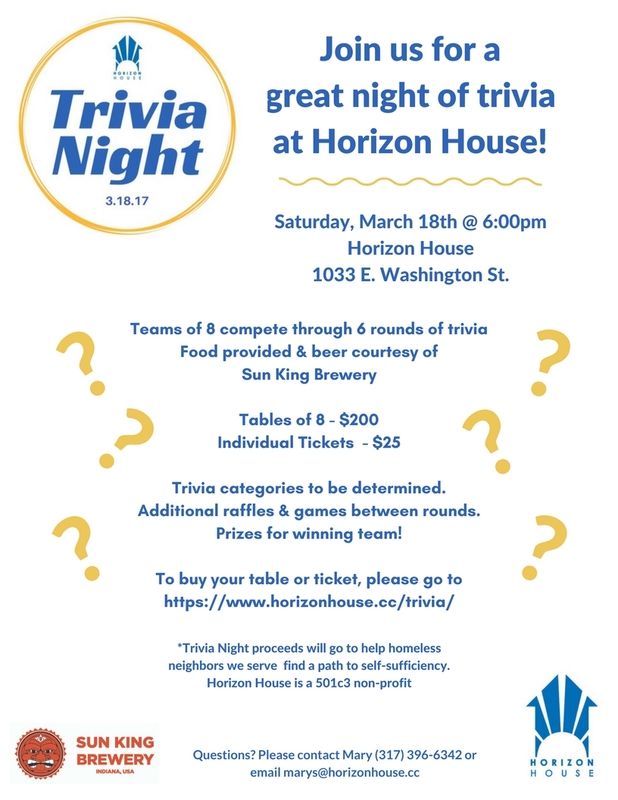 Join us for this great night of Trivia – CLICK HERE for more information and to pay for your table or ticket. If you bring donations by, please visit Monday, Tuesday, Thursday or Friday from 7am to 3pm or Wednesday 7am to 12:30pm; please enter through doors off Southeastern Ave.; if you find doors are locked, please knock. If you have any questions, please call Mary at (317) 396-6342.